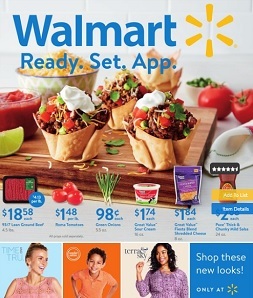 Current savings from the Walmart Ad, valid April 21 – April 25, 2019: $18.58 93/7 Lean Ground Beef; $1.48 lb Roma Tomatoes; $.98 Green Onions; $1.74 Great Value Sour Cream; $1.84 Great Value Fiesta Blend Shredded Cheese; $2.68 Pace Thick & Chunky Mild Salsa; $1.94 lb Boneless Half Pork Loin; $4.47 lb Select Beef Chuck Roast; $3.42 Olive Garden Italian Dressing; $1.78 Marzetti Cheese & Garlic Croutons; $1.98 Grape Tomatoes; $2.46 Marketside 8-Pc. Savory Garlic Knots; $1.18 lb Broccoli Crowns; $3.98 Marketside Salad; $7.28 John Soules Foods Fully Cooked Beef Fajitas; $5.48 John Soules Foods Fully Cooked Chicken Fajitas; $9.98 Great Value Pulled Pork Meal Kit; $9.98 Vegetable Tray; $3.18 LaCroix Sparkling Water 8 Pack; $2.78 Great Value Rising Crust Pepperoni Pizza; $1.68 lb Frozen Bone-In Turkey Breast; and more. Find all deals and offers in the latest Walmart Weekly Ad for your local store.